Rep. Liz Cheney (R., Wyo.) 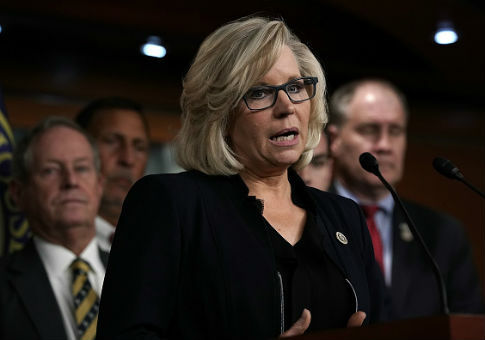 announced her support for the Trump administration's decision to remove the United States from the Intermediate-Rang Nuclear Forces Treaty if Russia does not comply within 60 days, saying on Tuesday action must be taken to counter the "grave the threat from Russia." "The statements issued today by both Secretary Pompeo and the NATO Foreign Ministers that Russia is in material breach of the INF Treaty are a clear indication that our European allies have joined with us in recognition of how grave the threat from Russia has become," Cheney said in a statement. Pompeo's statement announcing the policy on Tuesday came alongside a statement from NATO foreign ministers formally announcing that Russia was in violation of the INF treaty by developing new ground-based missile systems. "Allies have concluded that Russia has developed and fielded a missile system, the 9M729, which violates the INF Treaty and poses significant risks to Euro-Atlantic security. We strongly support the finding of the United States that Russia is in material breach of its obligations under the INF Treaty," the NATO foreign ministers said. "In light of these facts," Pompeo said in his statement, "the United States today declares it has found Russia in material breach of the treaty and will suspend our obligations as a remedy effective in 60 days unless Russia returns to full and verifiable compliance." Cheney applauded the administration's work with NATO on the matter. "The Trump Administration deserves tremendous credit for working closely with NATO to deliver a strong, united message that the days of turning a blind eye to Russian violations of international agreements are over. It is now up to Russia to decide over the next 60 days whether it wants to return to full, verifiable compliance, and if not I fully support the Administration’s decision to suspend its obligations under the treaty," she said. "I hope my Democratic colleagues who have claimed the Trump Administration is not working with NATO to address Russia’s violation of the INF Treaty will now begin to work constructively with theAdministration to secure our nation against the threats posed by Russia," she said. Cheney and Sen. Tom Cotton (R., Ark.) introduced the Stopping Russian Nuclear Aggression Act on Nov. 28 to "limit Russia's nuclear buildup." The INF Treaty was originally signed by President Ronald Reagan in 1987. Trump announced his intention in October to withdraw from the Cold-War era treaty, saying Russia "violated the agreement." This entry was posted in National Security and tagged Liz Cheney, Mike Pompeo, NATO, Nuclear Weapons, Russia. Bookmark the permalink.